Gold is trading at Rs 31,850 per 10 gram amid buying by local jewellers and positive global sentiment. In the international market, gold was trading at USD 1,224.30 an ounce and silver was at USD 14.21 an ounce. New Delhi: Gold prices rose by Rs 100 to Rs 31,850 per 10 gram on Monday amid buying by local jewellers and positive global sentiment. Silver, too, gained Rs 150 to Rs 37,450 per kg amid increased demand from industrial units. Bullion traders said that demand from local jewellers at the domestic spot market mainly kept gold prices higher following a positive trend overseas. In the international market, gold was trading at USD 1,224.30 an ounce and silver was at USD 14.21 an ounce. In the national capital, gold of 99.9 per cent and 99.5 per cent purity rose by Rs 100 each to Rs 31,850 per 10 gram and Rs 31,700 per 10 gram, respectively. 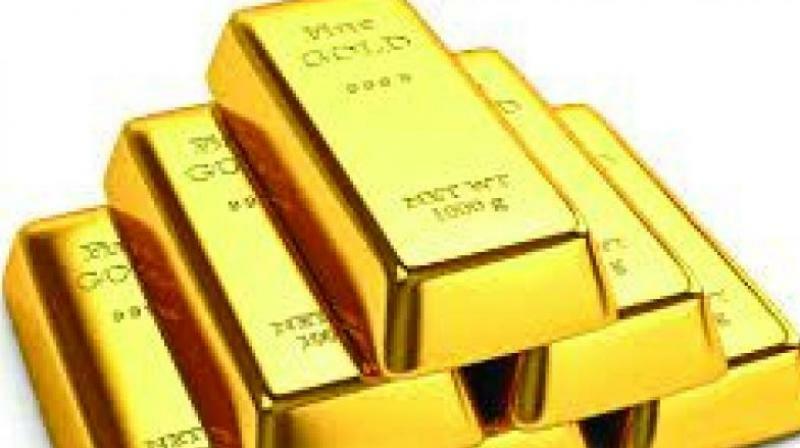 Sovereign gold also rose by Rs 100 to Rs 24,800 per piece of 8 gram. In line with gold, silver ready advanced by Rs 150 to Rs 37,450 per kg and weekly-based delivery gained Rs 209 to Rs 36,309 per kg. Silver coins continued to be traded at the previous level of Rs 73,000 for buying and Rs 74,000 for selling of 100 pieces.